Carrot Soap has vitamin A, B1, B2, B3, B6, B12, C, E, K. Great for nourishing your skin as well as babies. Order your bar today. No added scent carrot baby soap. FRESH PUREED CARROTS are added for color and because it repairs and tones the skin, reduces wrinkles and scars, improves circulation, increases elasticity, and provides the skin with beta carotene, which is an antioxidant. Carrots contain the following vitamins and minerals to nourish your skin: Vitamin A, B1, B2, B3, B6, B12, C, E, K, calcium, iron, potassium, phosphorus, and magnesium. No fragrance is added to keep this soap as mild as possible. However, it has a nice subtle fresh clean fragrance from the oils and carrots. With all of the above being said mainly this soap was created to gently clean delicate skin. When I created this homemade bar soap it was done with the intention of creating a ultra gentle soap to be used on my first grandchild! I wanted him to start life with the best skin care I could provide for him. This soap has been curing for FOUR months. Soap is like a bottle of wine. It gets better with age. As soap matures it dehydrates and becomes harder. But more importantly it becomes more gentle. And we only want the best gentle chemical free soap for the babies in our lives. 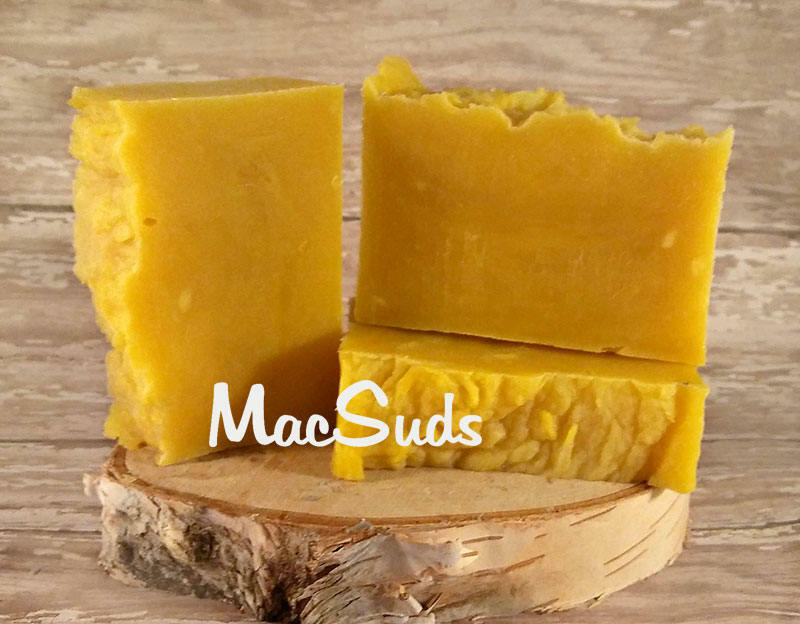 You can rest easy knowing your are providing him/her with a creamy, vitamin rich, pure soap handmade soap. It's great on any baby's skin, but it's also great for eczema skin and it is great as a bar for teenage and adult facial care. It helps minimize pores and dry out acne. **Olive Oil prevents the loss of your skin's natural moisture, softens skin and attracts external moisture to your skin. It helps keeps your skin soft, supple and younger looking. **Coconut Oil the health benefits of coconut oil in cold process soap for skin are amazing; the oil possesses antimicrobial, anti-fungal, anti-bacterial, and antioxidant properties. The lauric, capric and caprylic acids within the oil are credited with many of these benefits. **Castor Oil attracts and holds moisture in the skin. **Mango Butter has skin softening, soothing & moisturizing properties. Helps to combat dry skin, eczema and dermatitis. Helpful in protecting the skin from the weather and UV radiation. And is said to be effective at reducing fine lines and wrinkles. The soaps arrived really fast and in great condition thank you. The soaps arrived really fast and I can't wait to try them out. This soap is amazing! Shipping was faster than Amazon!